Consider a weighted graph G whose vertices are points in the plane and edges are line segments between pairs of points. The weight of each edge is the Euclidean distance between its two endpoints. A routing algorithm on G has a competitive ratio of c if the length of the path produced by the algorithm from any vertex s to any vertex t is at most c times the length of the shortest path from s to t in G. If the length of the path is at most c|[st]| (where |[st]| is the length of the line segment [st]), we say that the routing algorithm has a routing ratio of c. The routing algorithm is online if it makes forwarding decisions based on (1) the k-neighborhood in G (for some integer constant \(k>0\)) of the current position of the message and (2) limited information stored in the message header. We present an online routing algorithm on the Delaunay triangulation with routing ratio less than 5.90. This improves upon the algorithm with best known routing ratio of 15.48. The algorithm is an adaptation, to the Delaunay triangulation, of the classic routing algorithm by Chew on the \(L_1\)-Delaunay triangulation. It makes forwarding decisions based on the 1-neighborhood of the current position of the message and the positions of the message source and destination only. This last requirement is an improvement over the best known online routing algorithms on the Delaunay triangulation which require the header of a message to also contain partial sums of distances along the routing path. 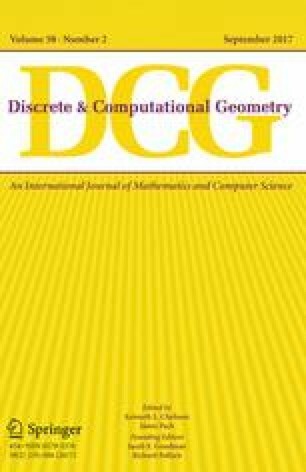 We show that the routing ratio of Chew’s algorithm on the Delaunay triangulation can be greater than 5.72 so the 5.90 upper bound is close to the best possible. We also show that the routing (resp., competitive) ratio of any deterministic k-local algorithm is at least 1.70 (resp., 1.33) for the Delaunay triangulation and 2.70 (resp. 1.12) for the \(L_1\)-Delaunay triangulation. In the case of the \(L_1\)-Delaunay triangulation, this implies that even though there always exists a path between s and t whose length is at most 2.61|[st]|, it is not always possible to route a message along a path of length less than 2.70|[st]|. We thank the reviewers for their thorough reviews and comments, which improved the quality and clarity of the paper. N. Bonichon was partially supported by ANR Grant JCJC EGOS ANR-12-JS02-002-01 and LIRCO. P. Bose was partially supported by NSERC.